The total population of Dhaka City grew from 0.1 million in 1906 to 9.9 million in 2000. The average annual national growth rate of the urban population in Bangladesh has doubled over the past decade (2000‐2009), at 3.3% compared to 1.8% respectively. The high rate of urban population growth has created significant population pressure to Dhaka as people migrate in search of employment. This population pressure has resulted in many illegal settlements along riverbanks across Dhaka City. Negligence of the Bangladeshi government to enforce existing laws against illegal settlements along the rivers encourages squatters to settle there. At the same time, land occupiers have profited from constructing houses and factories illegally along the Buriganga this encouraging similar malfeasance by others profit seekers. To expand riverfront properties, these occupiers would dump garbage intentionally along the riverbanks. The governmental authorities consistently ignored the scale of unauthorized occupation along the Buriganga. In May 2001, the Bangladesh Inland Water Transport Authority (BIWTA) identified 204 illegal structures built on both banks of the Buriganga. The list was revised to 309 two months later (July 2001) when the actual number of illegal structures, estimated by environmental activists, may be as high as 5,000. Haphazard and unregulated growth along the Buriganga riverbank not only contributes significantly to river pollution, but also reduces the river’s navigability from siltation. The construction of illegal structures has caused siltation of more than 10 feet through a 10km stretch on the Buriganaga between Kamrangirchar and the China‐Bangla Friendship Bridge. The decreasing water flow through this channel has reduced the navigability of the Buriganga at an alarming rate. From 1991 to 2000, the Buriganga lost 1.5 meters in depth, reducing from 4.57 meters to 3.05 meters. 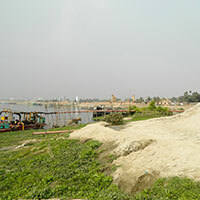 This siltation process accelerates the death of the river, which ultimately threatens the economic lifeline of Dhaka as it is the key trade and transport route. Lack of enforcement to prevent illegal settlement on the banks of the Buriganga is not the only failure by policy‐makers of Bangladesh. Complacency and corruption have also made it hard to protect the public interest in river‐related issues. Illegal dumping of un‐burnt fuel is an egregious case illustrating bureaucratic incompetency facing the future of the Buriganga. Currently, unfit open motorboats, steamers and engine boats illegally discharge un‐burnt fuel into the river. BIWTA recently started checking the fitness of large passenger‐carrying motorboats and more than 70% were found to be discharging fuel illegally. Despite these findings, BIWTA discontinued the program and no significant measures were taken against the offenders or to prevent such dumping in the future.